"She's too aggressive, too bossy... You don't want to be bossy," said a teacher about a ninth grader named Sheryl Sandberg. Thankfully, Sandberg -- Facebook COO, best-selling author and all-around badass -- didn't listen. The word "bossy" carries an overtly negative connotation that is almost exclusively applied to women in leadership roles. A man is a "boss" while a woman is "bossy." Luckily, Sandberg paid no heed to the "bossy" charge, but the negative messages built into such words still have the potential to discourage girls from pursuing leadership roles. With hopes to curb the use of this word and empower young women, Sandberg, along with former secretary of state Condoleezza Rice and CEO of the Girl Scouts of the USA Anna Maria Chávez, have teamed up to launch a public service campaign called "Ban BOSSY." 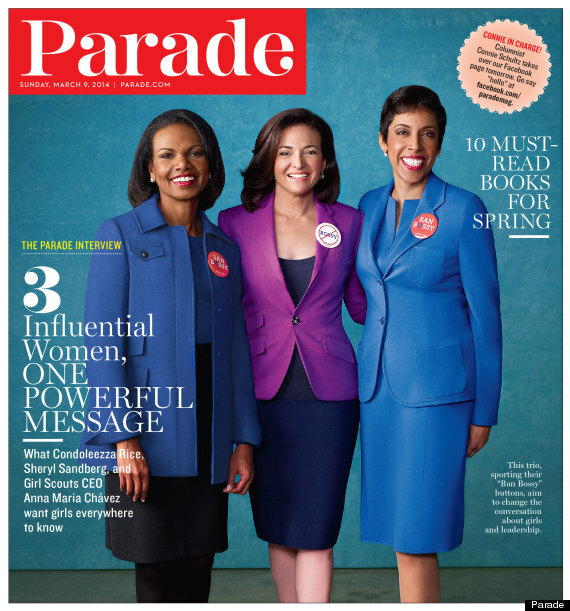 Rice, Sandberg and Chávez discussed the positive effects of lifelong encouraging dialogue on their careers: “My parents elected me president of the family when I was 4. … I would call meetings where we’d decide things like what color to paint the living room," Rice told Parade. "As I got older, I realized that what my parents were doing was sending messages about leadership potential.” By excluding the word "bossy" in conversations surrounding young women and leadership, the powerful trio hope to encourage more girls to pursue their aspirations -- and ensure they'll be met with supportive feedback along the way. To read the full interview go to Parade.com or pick up a copy this Sunday, March 9th.